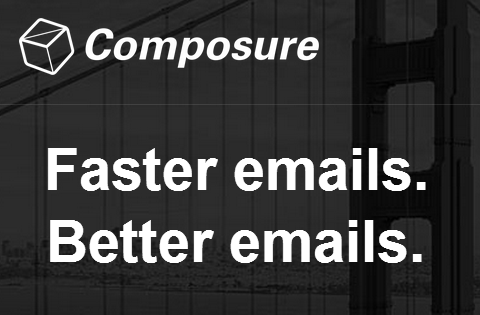 Composure is a very clever bit of software. An extension for Gmail, it will try to complete not individual words but whole phrases as you type them. On my tests it does a remarkable job of judging what you might want to say next. While far from perfect it certainly makes a fair stab at what might be your next intent. Most of the time it provides suggestions for one-to-two words ahead of what you are typing, but with more commonly used phrases, especially it seems in a business context, it offers longer suggestions. You can also train Composure to recognise phrases you use a lot. Composure, by the way, was created by some very clever Sydney-siders. It clearly works best if you are a touch typist and so looking at the screen for the neat cues instead of at your fumbling fingers. It still functions fine if you don’t touch type, it’s just that bit less efficient. I can’t blame Composure for that – only once again rail against my own touch-typing inadequacy. Perhaps the only quibble I have with Composure so far is that I’d rather it used the Space key to trigger the auto completion. I’ll probably get used to using the Enter key but it doesn’t feel natural to me: I press Space after words, I only use Enter at the end of a paragraph. Composure is free, installed in seconds, and uninstalled just as quickly – so there’s no reason not to give it a try and see if it works for you. For all the details and the link to download see here.